Oh, what an amazing couple of days we’d had! On the first day we enjoyed a magical evening in Monte Carlo and on the second we flew to the Grasse Rose Fields, and it was nothing short of remarkable. To say we didn’t want today to be our last day in Monaco would be a huge understatement, but alas, it was and we weren’t about to let it ruin another beautiful morning. Our day began at the top of the Fairmont Monte Carlo, where we lapped up the warm sunshine and lazed on the day beds by the pool at the luxurious Nikki Beach. Since our cute little #FairmontxLeLabo family included two of Instagram’s best flat layer’s (@lichipan and @polabur, I’m looking at you! ), we couldn’t help but create the ultimate breakfast moment and then gobble it all up afterwards. From fresh berries and baked goods to delicious coffee and pretty smoothies, with a view of Monte Carlo on one side and uninterrupted views of the Mediterranean Sea, it was the perfect last morning. Did I mention the amazingly great coffee? We even got a cappuccino to go! 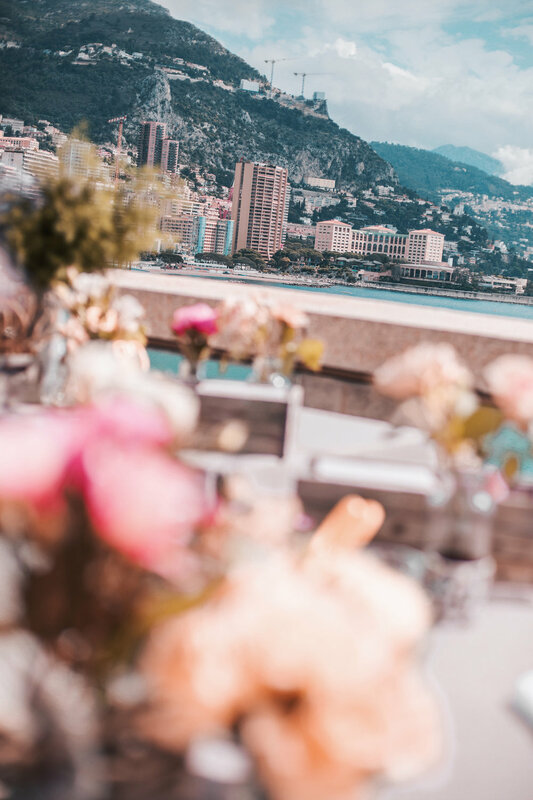 After we’d flat layed out little hearts out, we had the privilege of touring the incredible Fairmont Monte Carlo Grand Prix Suite with views of the Formula One hairpin, Monaco, France and the Mediterranean. Impressive, right? Trust me when I say, it doesn’t get much better than that. When we’d admired the stunning views, we settled on one of the private terraces for a floral garland making session. Now I’m not going to lie, my talents do not include many hands-on activities and apparently creating flower crowns lies within this category. BUT I did not give-up. No, I didn’t. And you know what? I’m kind of thrilled with my flower crown in all of its delicate prettiness, even if it took me forever. What do you think? Midday had come and it was sadly time to say our goodbyes to our amazing #FairmontxLeLabo family. It’s so rare to have a group of people come together that bond so well, but we did just that and I couldn’t have chosen a more fabulous bunch of people to experience such an magical part of the world with myself. While our time together had come and gone, I walked away feeling even more motivated and inspired than ever before. That’s what happens when you spend a few days with some of the most beautiful, aspirational and talented women (and their gorgeous partners!). With packed lunches from Horizon Deck, we went back to our hotel room to pack our suitcases (also known as me taking all the Le Labo Fragrances Rose 31 amenities from the ensuite bathroom – heh-heh-heh!) and enjoy the incredible sea views one last time. It was time to check-out and get our transfer back to Nice Côte d’Azur Airport. As reluctant as we were to leave majestic Monaco, we knew we’d be back again before we knew it. 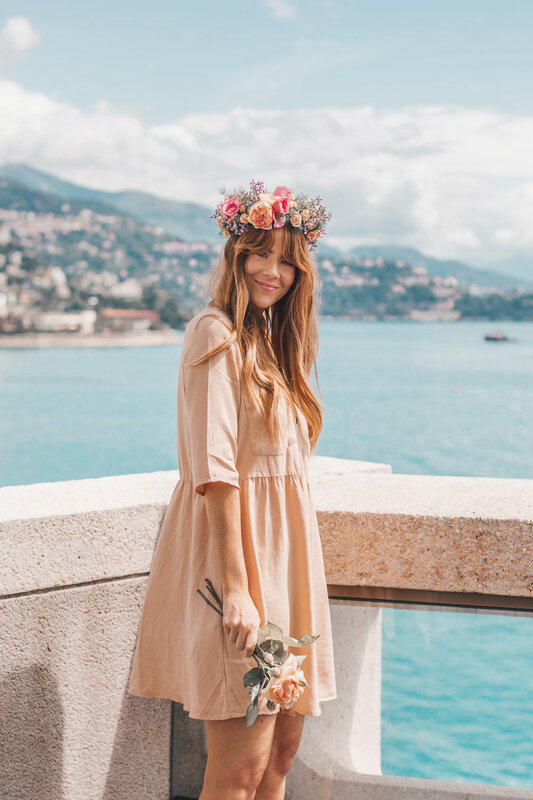 Both Brad and I had really fallen in-love with the charming French Riviera and Monaco, and already have a huge list of places we want to visit next time. Plus, I was beyond excited to be reunited with our fluff ball of a cat, @IndiTheFur on our arrival home. We just had to get through two long haul flights, three airports and 24-hours of travel. Worth it. Zara shirt dress and backpack, ASOS baker boy cap, Ray-Ban round sunglasses, CLUSE gold watch and fine necklaces, and Balenciaga boots. Make sure you follow the rest of the fabulous #FairmontxLeLabo crew!